Helene Rottenberg is a Professor of Music atMadonna University in Livonia, MI. 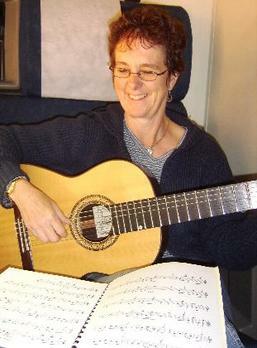 She taught guitar at Herb David Guitar Studio in Ann Arbor, MI for 39 years. She is a board member of The Guitar Foundation of America, has a Master of Musicology degree from the University of Michigan and was a student of the late Argentinean guitarist,Manuel Lopez-Ramos. Helene has performed extensively in the Midwest- particularly in the Detroit/Ann Arbor area, since 1975. She has often played as a featured performer in chamber music concerts at the Festival of the Lakes in Alexandria, Minnesota, and has appeared on Minnesota Public Radio. She plays professionally in a flute/guitar duo,Divertimente, with flutist Susan Lazar, and they recently have released their first CD, featuring music by Mario Castelnuovo-Tedesco, Johann Sebastian Bach, and Bela Bartok. She performs as a soloist and also enjoys playing in various ensembles. She has often played with Chamber Music at the Scarab Club, and is a regular performer with Woodward Corridor Musicians and the Detroit Concert Choir. workshops at the Guitar Foundation of America Conference.